Q. Curtius was one of the moneyers for the year 116-115 BC. 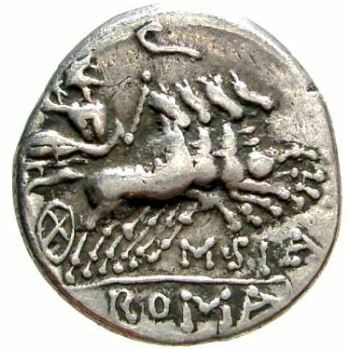 He struck coins jointly with his colleagues for the year, M. Junius Silanus and Cn. Domitius Cn.f. Cn.n. Ahenobarbus, but is not otherwise known. Gens Curtia was an ancient but minor noble family at Rome, with both patrician and plebeian branches. The only member of the gens invested with the consulship under the Republic was Gaius Curtius Philo, in 445 BC. A few Curtii held lesser magistracies during the Republic, and there were two consuls suffectus in imperial times. However, the gens is best remembered from a series of legends dating from the traditional founding of the city to the early Republic.